Synagogue-chief. The use of this name as the title of the officer who supervised matters pertaining to the religious services of the synagogue can be traced from the time of Jesus to about the year 300 (Pes. 49b). It occurs several times in the New Testament. The distinctive function of the Archisynagogue was to select suitable men for the reading of the Law, the reciting of prayers, and for preaching; since in ancient times the synagogue did not have regularly appointed officers for the performance of these duties. 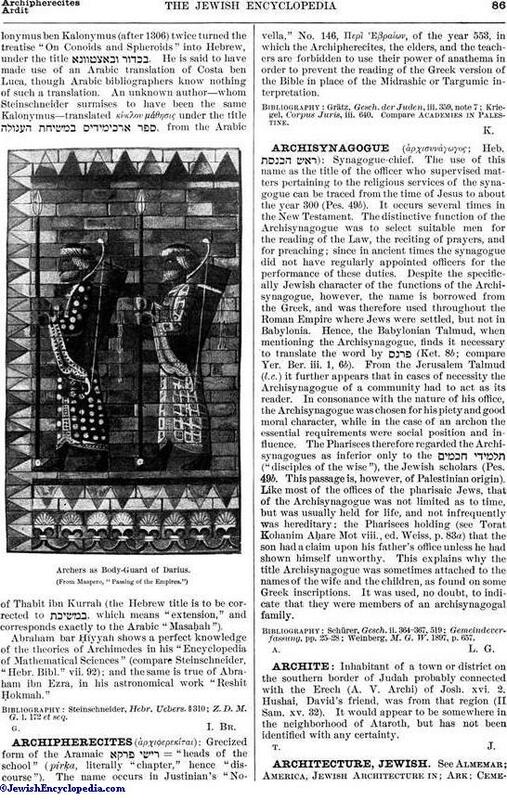 Despite the specifically Jewish character of the functions of the Archisynagogue, however, the name is borrowed from the Greek, and was therefore used throughout the Roman Empire where Jews were settled, but not in Babylonia. Hence, the Babylonian Talmud, when mentioning the Archisynagogue, finds it necessary to translate the word by (Ket. 8b; compare Yer. Ber. iii. 1, 6b). From the Jerusalem Talmud (l.c.) it further appears that in cases of necessity the Archisynagogue of a community had to act as its reader. In consonance with the nature of his office, the Archisynagogue was chosen for his piety and good moral character, while in the case of an archon the essential requirements were social position and influence. The Pharisees therefore regarded the Archisynagogues as inferior only to the ("disciples of the wise"), the Jewish scholars (Pes. 49b. This passage is, however, of Palestinian origin). Like most of the offices of the pharisaic Jews, that of the Archisynagogue was not limited as to time, but was usually held for life, and not infrequently was hereditary; the Pharisees holding (see Torat Kohanim AḦare Mot viii., ed. Weiss, p. 83a) that the son had a claim upon his father's office unless he had shown himself unworthy. This explains why the title Archisynagogue was sometimes attached to the names of the wife and the children, as found on some Greek inscriptions. It was used, no doubt, to indicate that they were members of an archisynagogal family. Weinberg, M. G. W. 1897, p. 657.